Since orange chicken is right up there as one of Brian's favorite meals in the history of ever, I suppose it was only a matter of time until something else orange-glazed arrived at the dinner table (and in the interest of full disclosure, he loves, loves, loves the stuff at Panda Express, even if I do not, and since we've lived many years without it until just recently, he's been reunited and it feels so good). Brilliant, right? Not only do they hold their shape, but they are a bit smaller than I'd probably normally make them and are just plain adorable. 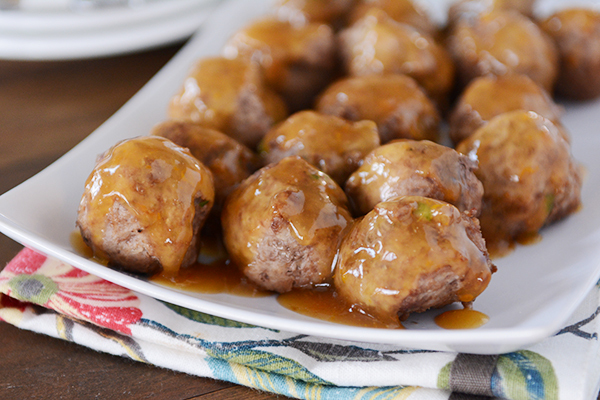 You know, if meatballs cared about being adorable. Of course you don't have to use a mini muffin tin (see the notes in the recipe) but if you have that type of pan, you should try it because it could bring you a lot of happiness like it did to me. Simple pleasures. Ground chicken or lean ground beef can be subbed for the ground turkey. I always buy chunks of ginger and cut them into 1-inch pieces, toss them in a freezer zipper bag (unpeeled) and then when a recipe calls for fresh ginger, I grab a piece straight from the freezer and grate it on the small holes of my box grater or on the microplane. 1. Preheat the oven to 475 degrees and lightly grease a mini muffin tin (see note above if you don't have that kind of pan). 2. 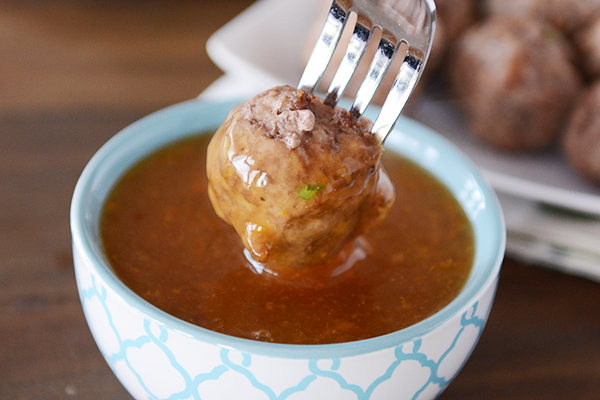 For the meatballs, combine all the meatball ingredients together in a large bowl and mix until combined (you might need to just get your hands in there and go to town). 3. 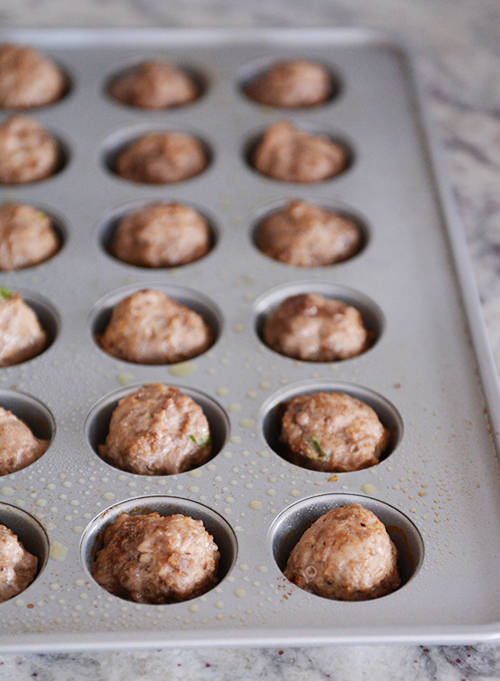 Shape the meatball mixture into small balls, a couple tablespoons each, and place into the prepared mini muffin tin. The meatballs will shrink down a bit while baking. 4. Bake for 15 minutes or until cooked through. 5. Immediately (but carefully) spoon the meatballs out of the tin and onto a layer of paper towels to drain any excess grease (you may not need to do this if the meat was extra lean). 6. For the glaze, whisk together all the ingredients in a small saucepan and bring to a simmer over medium heat, stirring often. Cook until thickened. Add salt and pepper to taste. 7. 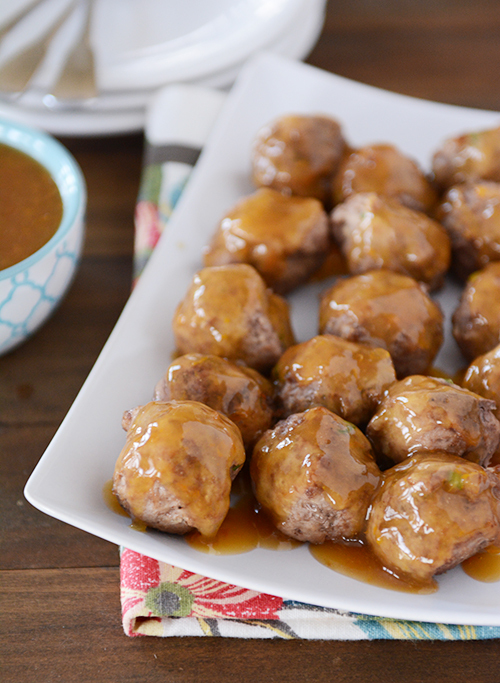 Serve the meatballs with the glaze (either poured over the meatballs or served separately for each person to drizzle on as they like).